Naturally Inspired Art & Design wishes you a wonderful Fall season and Thanksgiving holiday. Thank you for subscribing to my monthly newsletter. I wish you a wonderful Fall season and upcoming Thanksgiving Holiday as well. This month, we have fun news, upcoming events and new projects for you to consider as a gift for the Winter Holidays. Consider a personalized gift for Christmas/Hanukah or any other special occasion. For more information on this event and others, please click on this link below. Place your custom order now for the holiday season. 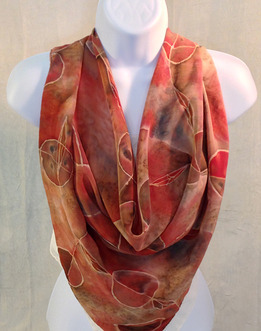 Give someone a personalized gift of a silk accessory or work of art. Orders must be placed 2-4 weeks before event/holiday. Please contact me by clicking on this link below. Contact me to discuss your next order or email me at: adria@adriawillenson and put “Custom Order” in the Subject line. Batik is made either by drawing dots and lines of the resist with a spouted tool called a canting, also spelled tjanting, by printing the resist with a copper stamp called a cap or using a brush. This technique, of manual wax-resist dyeing, may be applied to whole cloth or to parts of a cloth. The applied wax resists dyes and therefore allows the artisan to add additional colors by soaking the cloth in different dye baths or applying color with a brush. 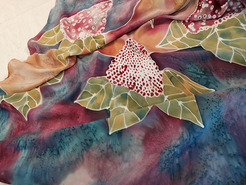 This process of waxing and dyeing can be repeated to create more detailed designs and imagery. Removing the wax can be a multi-step process. Use boiling water and immerse the fabric into a pot to melt away the wax off of the cloth. You may re-use the wax by allowing the pot to cool and take the wax off of the top. Any remnants of wax on the cloth may be ironed off by putting newspaper over the cloth to absorb the remaining wax. Hi Valued Customer,For this upcoming holiday season, consider a custom textile artwork for your home or office. 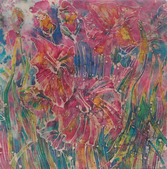 I am a textile artist with 10 years of experience working with a variety of fabrics such as silk, bamboo and others. 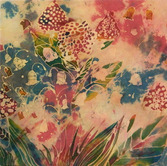 I hand-design and dye using a variety of techniques such as batik, serti and shibori to create one of a kind works of art. If you would be interested in one of these pieces or placing an order, contact me at: (262) 853-5782 or email me with any questions you may have. 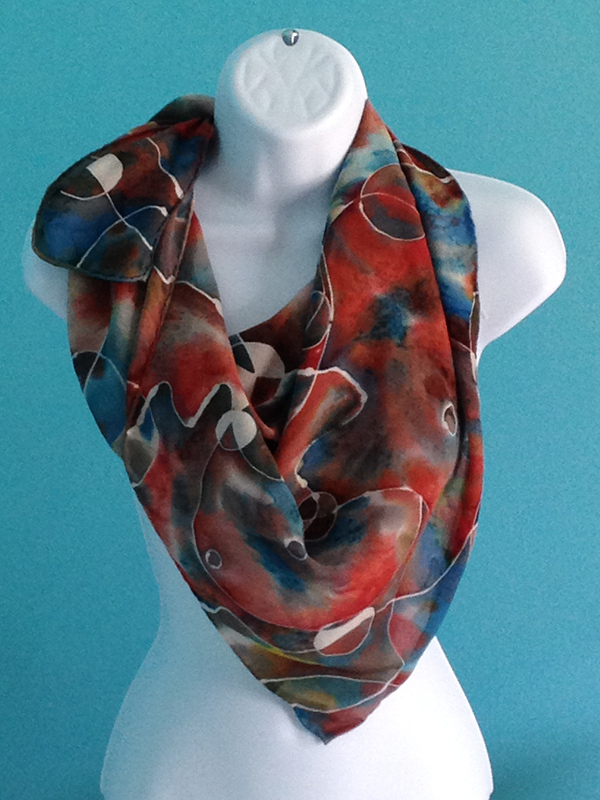 Consider a custom designed scarf for a special occasion or as a gift for an anniversary or birthday. 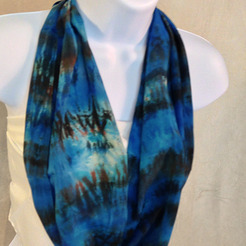 We have hand-designed scarves available for sale through our on-line store. GROUP ORDERS If you are interested in placing a group order, click here to learn more. Naturally Inspired Art & Design combines a love of nature with highly stylized, wearable and fine art. 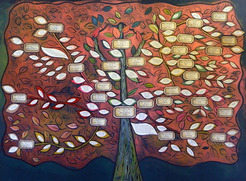 Our hand-made scarves and customized fine art & murals are attractive for your home or office. Our unique designs are inspired by nature. 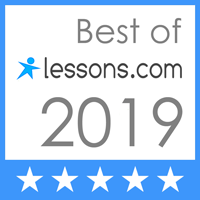 Send to a friend and sign up for future promotions and latest news. We hope you are having a wonderful Summer season. We have some nice events coming up and promotions as well. Please feel free to forward this on to your friends, “LIKE” me on Facebook and “FOLLOW” me on Twitter. Naturally Inspired Art & Design will be showcasing fine art and personal accessories at this event. 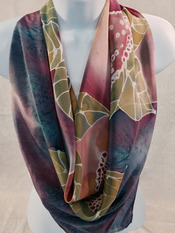 Naturally Inspired Art & Design also offers a free shipping promotion if you order your scarves on-line. Use coupon code: FREESHIP. Instructions: Fold a long scarf if half lengthwise. Grab the diagonal ends and knot them together. Put it over your neck, then twist it and loop again. Click here to see step by step instructions. Email: naturallyinspiredartanddesign@gmail.com or click here. Thank you so much for your support with my business and for being wonderful existing clients. 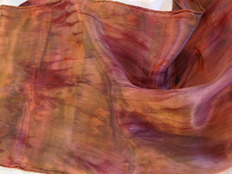 Handmade Silk Scarves – Ellipse ThemeThese silk scarves was designed and dyed using the serti-resist method. Silk Fabric: Crepe de Chine with hand-rolled edges. 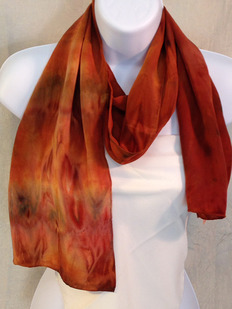 Care Instructions: The silk dyes are permanently set, so each scarf is hand-washable. Hand wash separately in cold water with mild soap. Hang on a towel rack to dry. When ironing, use the cooler silk setting. Avoid steam option and iron this scarf while slightly damp.